Human minds cling to negatives more than positives. This helps us prepare for the next time a negative comes around, and lets us experience a positive anew again, unprepared for the pleasure. Every year I marvel as in childhood, uplifted a little out of myself, as if it were my first time walking in the woods at night during the first accumulating snow of the season. During a slow sylvan saunter, if I stand still more than move, in bodily senses and in palpable transcendent essences I find reminders that nature made me to thrive among immortal woodland spirits, in refuge from the illusory blessings of merely mortal society. I cannot exceed the company of trees, nor regret deep solitude among them. Warning: this article is 3,200 words; not a bloggism; a blogASM. I warned you. Now enjoy. As the beautiful old song from The Sound of Music says: “Climb every mountain / ford every stream / follow every rainbow / ’til you find your” swamp. Another sample of Spring 2013 advancing. One of our early ferns (May 6) did a little lifting on its way up. Balsamea never stops entertaining us. The leaf was gone the next day, so my camera-play had been lucky, leaving me with a souvenir of mindful woods-walking. That’s what most of my photos from Balsamea are about: just taking time to notice what is really there. It is a fun hobby to collect souvenirs to remember things, and to remind me to keep being mindful of them. It is good medicine to mind and body. However, sometimes I make a point of leaving the camera home, to “bathe” in the essence of the forest just for the sake of doing it, taking a lesson from my canine partner, being there just to be there, belonging there. But Buddy has learned to pause the walk on his own when he sees the camera come out of its case. The Healing Power of a Walk in the Woods (eartheasy.com) – some studies are developing ways to quantify the health benefits of forest walking, and to identify the reasons, such as plant emissions. Noticing: How to Take a Walk in the Woods – by Adam Frank, NPR (www.npr.org/blogs/13.7) – Some good ideas on getting more from a walk in the woods; ideas that I use all the time. Actually, it’s around 1058 words. Originally I intended to let the snowshoe path pictures in my previous blog post speak for themselves. Today, Pyrrhite’s comment on that post got me wondering about what makes Balsamea’s snowshoe paths so attractive to me that I popped off more than 200 snapshots hoping to get lucky in the handful I found worth posting here. 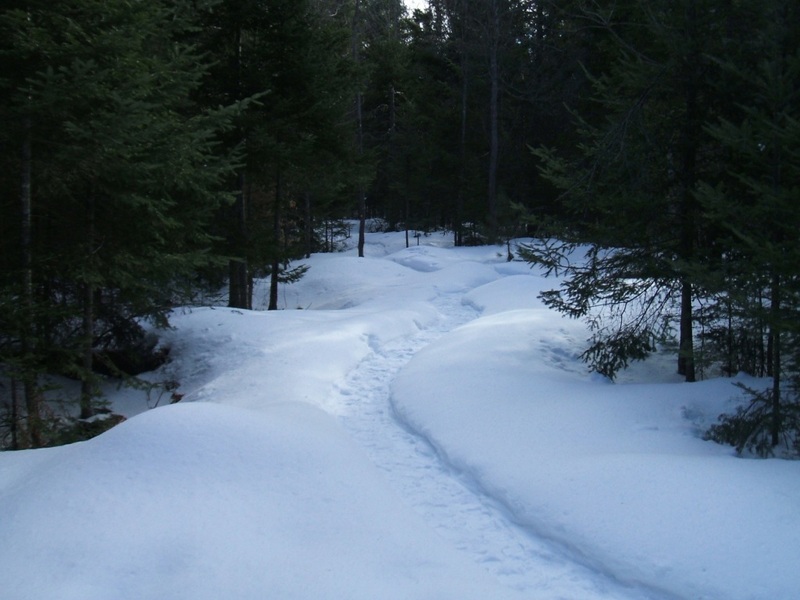 In pithy Pyrrhite style, I read, “I love snowshoe trails. Nothing much is quite as compelling.” Why are they so compelling? Okay, Py, you pulled the cord to muse up a scribblement. Let’s see if I have the gas to shoot through it quickly, because I am supposed to be doing something else. I may be a scribblement addict, and you an enabler. These photos from March 26, 2013 are samples of Balsamea’s snowshoeing paths just before the big thaw. This is a taste of the blessing of Balsamea that Buddy and I walk through three times every day, all year, in all weather, day and night, without fail. 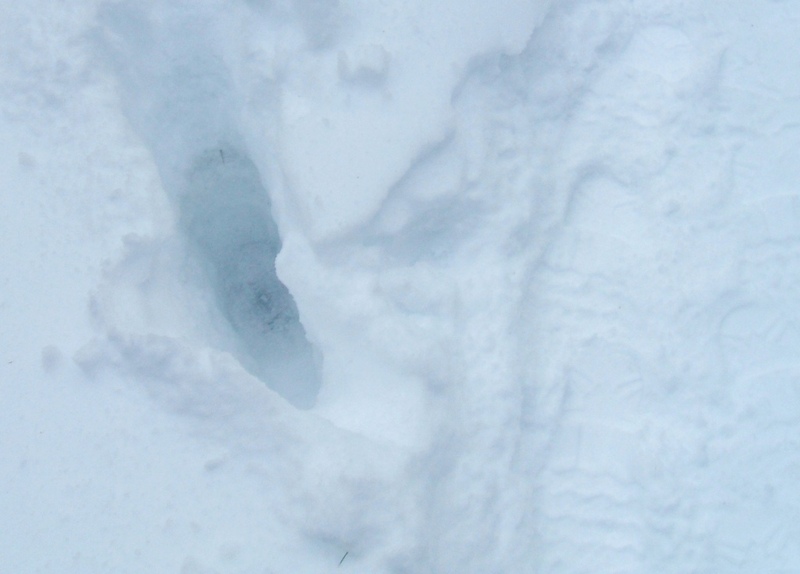 In many places the snow is still as much as 18 inches deep (hole to the left), placing the floor of the path (right) at about one foot above the ground. That is very densely packed snow, from months of accumulations and walking on it. Usually it begins turning to treacherous ice this time of year, and I rely on strap-on ice cleats. So far icing has not happened. It seems we will have a short ice spell, if any. Click any picture to see large views in carousel mode.